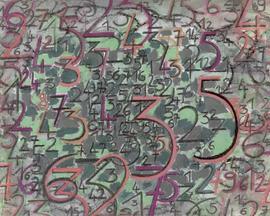 Prime numbers, which can only be divisible by themselves, are presumably infinite. However, the higher you count, the fewer and farther between prime numbers are. The previous highest known prime number held the record for nearly three years. On January 25, 2013, 2 to the power of 57,885,161 minus 1, a figure 17,425,170 digits long, was announced by Great Internet Mersenne Prime Search. To celebrate its 20th anniversary, GIMPS has just announced a new record. The new highest known prime number is 2 to the power of 74,207,281 minus 1, and it clocks in at 22,338,618 digits. You can download a 10.2MB zip file of the number here. Curtis Cooper of the University of Central Missouri volunteered the computer and oversaw the calculation. It is the fourth record for Cooper, who volunteers the most CPU time for the GIMPS project. Scott Kurowski and Aaron Blosser of GIMPS also share credit for the discovery. M74207281, as the number is called, took 31 days to calculate on a computer running an Intel I7-4790 CPU, running software designed by GIMPS founder George Woltman. It reached the prime number by multiplying two with itself 74,207,281 times, then subtracting one. The result was then independently verified. This makes M74207281 not just any prime number, but also what is known as a Mersenne prime, a prime number that is one less than the power of two, named for Jesuit scholar Marin Mersenne, who studied them in the 17th century. Only 49 such Mersenne primes have been discovered, 16 of which have been found by GIMPS. The next major goal, according to GIMPS, is a much bigger jump: They hope to award the record and a $150,000 prize to the Electronic Frontier Foundation for a 100 million digit prime number. So sharpen your pencils and get out your calculators.